The Annual Bowls Jersey Presidents Day match was held at the Sun Bowls Club on Friday 5th May. A men’s and ladies rink from each of the islands clubs turned out to compete in what is a battle of the sexes! The Club Presidents are specifically asked to select people who volunteer a lot of their time to the running of their clubs. Holding a big advantage, the Men who before this encounter had won the trophy 24 times compared to the Ladies 4 were the early favourites. 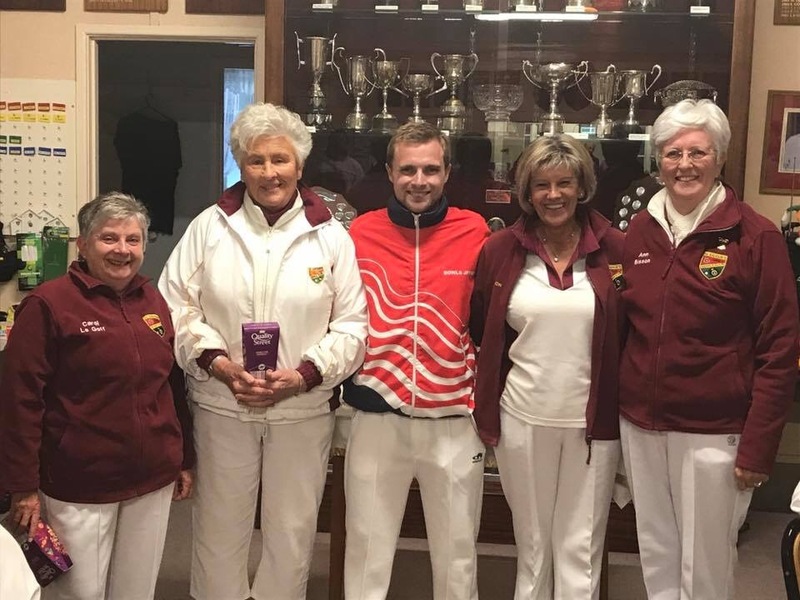 At the half way stage, the Ladies were in control of the match and only a dogged fight back by the men could save their blushes – which to the relief of Bowls Jersey President Greg they did. Congratulations to the highest winning rink, which for a 3rd year in a row has gone to a Ladies rink, and pictured below with President Greg Davis are the St Saviours quartet of Carol Le Goff, Marie Jacques, Ann Richardson and Ann Bisson. A lot of fun was had by all, the first time the game had been played of an evening; it was all agreed the new time was much better but next year we will play in July where the weather and wind may be slightly warmer!